Bob Burg and John David Mann describe how to change your way of selling. They focus on five laws which are based on giving value first and also to be able to receive value by others. There are five laws: Law of Value (i.e. give value to others), Law of Compensation (reach people and build relationships), Law of Influence (help people to reach their goals), Law of Authenticity (you are your most valuable product) and Law of Receptivity (be open to receive). 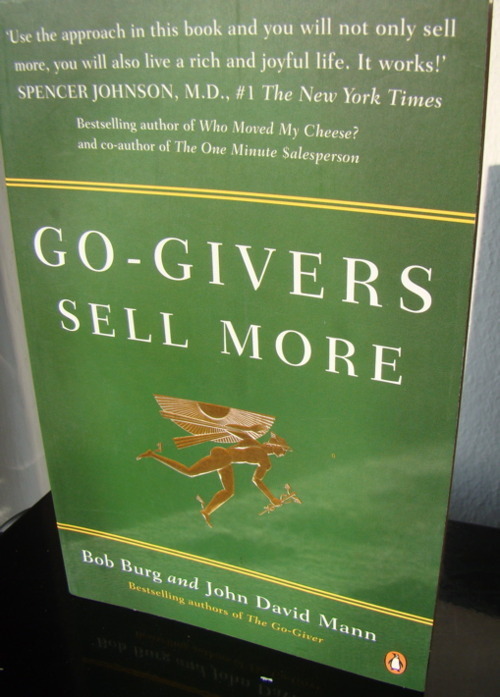 This book takes the selling out of sales. It is pretty intuitive: You can’t force an other person into selling your product. The best thing you can do is provide value (e.g. understand their problem, help them to get what they really want) and build a genuine relationship with them. It is not bad if they don’t buy your product. In building this relationship they may recommend you to their friends. Make your opponent feel good. The other important thing is that doing good and making money aren’t opposites. Chris Guillebeau also emphasized it. And it is true. This is the Law of Receptivity, don’t be inhibited to make sales. Don’t be inhibited to get help from others. Give value, get value! Hurray the first 10% are done! But I wouldn’t writing this now without you, the people who read this blog, thank you for your precious time. Especially Ahmad Taleb who is promoting this blog on twitter and Mike McGee who effortlessly reblogged a bunch of my posts. Thank you guys, you are awesome!